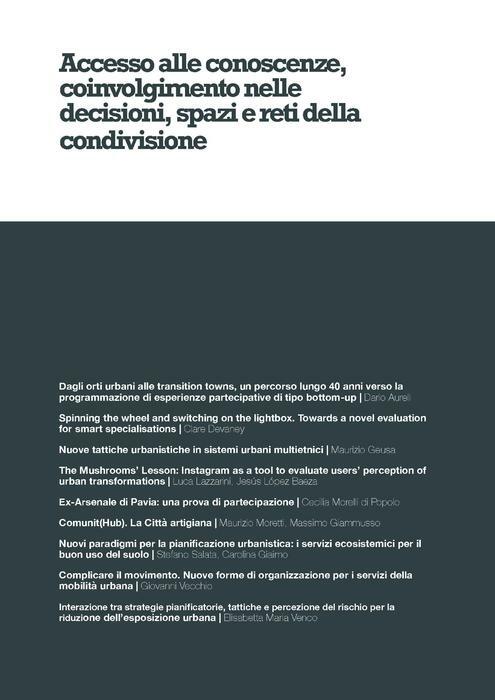 As a continuation of activities and discussions already begun, and in order to provide further input on the paths defined in the 29th INU - Italian National Institute of Urban Planning National Conference, INU and Urbit, in collaboration with Urbanistica and Planum. 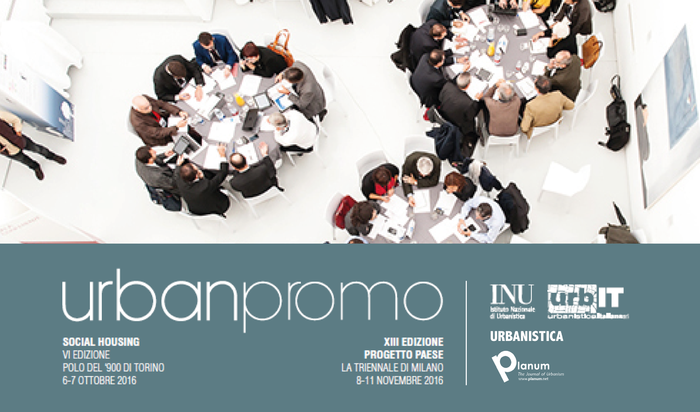 The Journal of Urbanism, have organized a scientific conference for Friday, 11 November 2016 at La Triennale di Milano, as part of the XIII Edition of URBANPROMO, Progetto Paese. The conference aims to involve researchers, scholars, and practitioners working at universities, in companies, and in public administrations. According to the literature, the critical analysis that has developed due to the economical-financial crisis that began in 2008 has now led to an understanding of how old industrial cities are addressing the austerity measures adopted by by national governments. These policies have often included big cuts to spending for local institutions, processes to privatize public properties, and the transfer or reduction of administrative duties previously assigned to the municipalities. 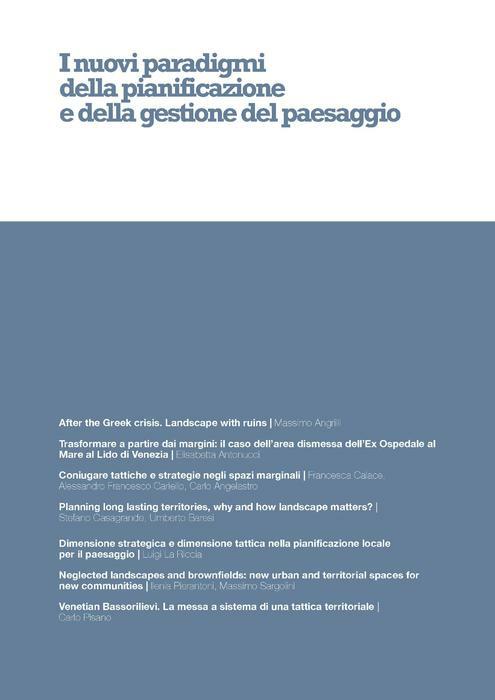 But while it is clear that urban decline is the origin of strong recessive trends, we still do not understand why islands of prosperity survive even in the most hard-hit cities, and why, in every single country, the gap between the performance supplied by the different agglomerations is still increasing. This inability to interpret the deepest roots of the urban crisis and its tendency to be connected to the controversial effects of the economic/financial crisis and climate change have likely led to the contemporary debate in urban planning fluctuating between the need to develop new large-scale, long-term plans and the urgency to experiment with urban tactics on a local, short-term basis. Because of this lack of knowledge, urban-planning tactics and long term strategies are still perceived as opposing formulas. At the same time, we cannot help but observe that recent contributions are starting to outline new models of intervention that propose original combinations of two different approaches. The first is a more traditional, normative method, with a neater representation of space, while the second relates to more temporary, less stringent regulations that can contribute to the creation of open-source urban planning. This implies bottom-up planning in which citizens actively contribute to pursuing more ambitious goals than what traditional territorial governing procedures are able to achieve. One example is the study of and search for effective solutions to urban shrinkage, climate change, and the abandonment of vast territories to degradation and crime, as well as the recovery of urban empty spaces for collective use. The attempt to overcome the traditional dichotomy between different planning scales and between general planning and sectoral disciplines is also moving in the same direction. 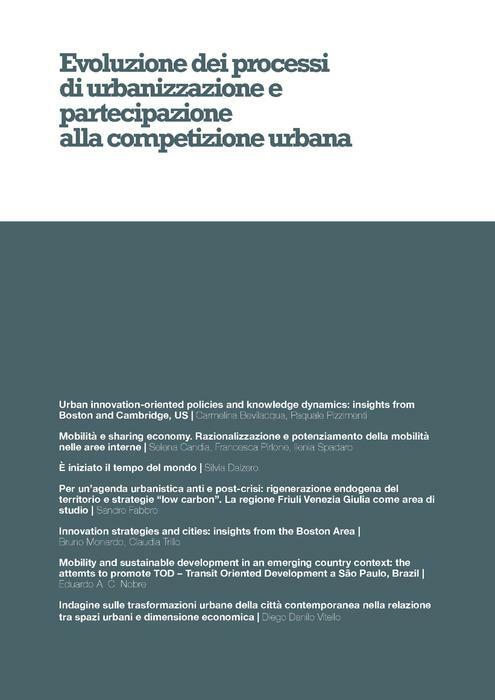 The complete Proceedings of the Conference can be freely download here: "UN NUOVO CICLO DELLA PIANIFICAZIONE URBANISTICA TRA TATTICA E STRATEGIA / A NEW CYCLE OF URBAN PLANNING BETWEEN TACTICS AND STRATEGY"
The Conference Proceedings' book is the result of all the papers accepted to the Conference and submitted to the peer-review process by the Scientif Commette. Only the authors regularly registered to the Conference are part of this publication. 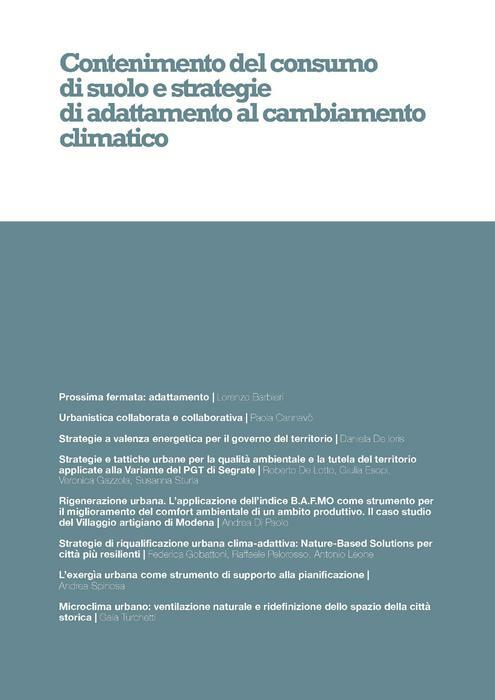 Each paper can be citated as part of: Talia M. (2016, a cura di), Un nuovo ciclo della pianificazione urbanistica tra tattica e strategia / A new cycle of Urban Planning between Tactic and Strategy, Planum Publisher, Roma-Milano. Selena Candia, Francesca Pirlone e Ilenia Spadaro | Silvia Dalzero | Sandro Fabbro | Eduardo A. C. Nobre | Carmelina Bevilacqua e Paquale Pizzimenti | Bruno Monardo e Claudia Trillo | Diego Danilo Vitello. Lorenzo Barbieri | Paola Cannavò | Daniela De Ioris | Roberto De Lotto, Giulia Esopi, Veronica Gazzola e Susanna Sturla | Andrea Di Paolo | Federica Gobattoni, Pelorosso Raffaele e Leone Antonio | Andrea Spinosa | Gaia Turchetti. Massimo Angrilli | Elisabetta Antonucci | Francesca Calace, Alessandro Francesco Cariello e Carlo Angelastro | Stefano Casagrande e Umberto Baresi | Luigi La Riccia | Ilenia Pierantoni e Massimo Sargolini | Carlo Pisano. 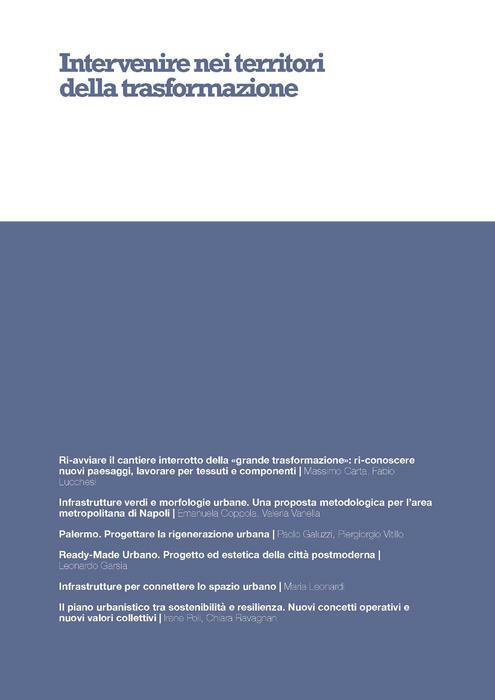 Dario Aureli | Maurizio Geusa | Luca Lazzarini e Jesús López Baeza | Cecilia Morelli di Popolo | Maurizio Moretti e Massimo Giammusso | Stefano Salata e Carolina Giaimo | Giovanni Vecchio | Elisabetta Maria Venco. 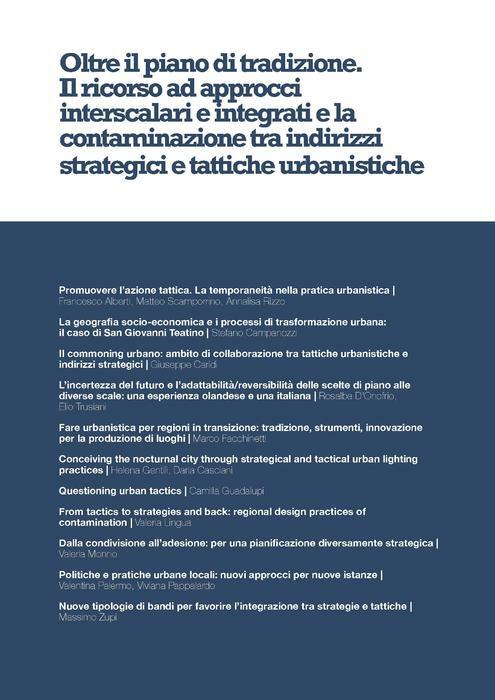 INTERNATIONAL CONFERENCE "UN NUOVO CICLO DELLA PIANIFICAZIONE URBANISTICA FRA TATTICA E STRATEGIA / A NEW CYCLE OF URBAN PLANNING BETWEEN TACTICS AND STRATEGY"
The publication is edited by Planum. The Journal of Urbanism.